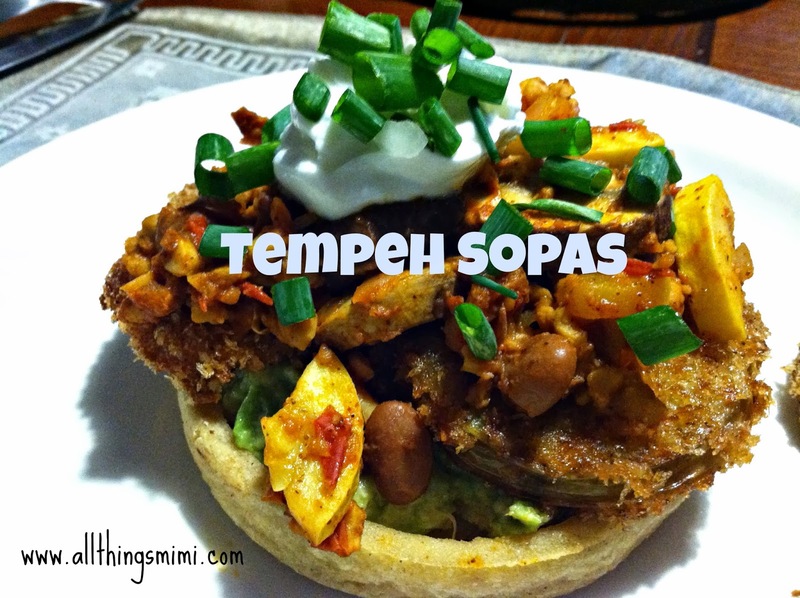 So tonight's dinner included two new things- sopas and tempeh. This was a rather involved dish- not hard- but it had several steps. First, I cut the tempeh into strips and put it in a marinade of orange and lemon juice, a bit of soy sauce and chile powder. I let it marinate for about 2 hours. Next, I fried some green tomatoes. I use a pretty standard breading technique- seasoned flour, then egg wash, then seasoned panko crumbs. After the tomatoes were done, I fried the sopas according to the directions on the package. I put the sopas and tomatoes in the oven on warm and began working on the filling. I put some olive oil in a skillet and added the tempeh. I let it brown a little, then added chopped onions, chopped yellow squash, sliced cremini mushrooms, a can of pinto beans (drained and rinsed) and about a cup of roasted grape tomato sauce I put up a few weeks ago. I added some dried oregano, chile powder, garlic powder and onion powder. I stirred it well and let it simmer away for about 15 minutes. I had a half of an avocado in the ice box, so I mashed it with some fresh lime juice and salt. To assemble the sopas, I retrieved the sopas from the oven, then put a layer of mashed avocado on the bottom, then 2 fried green tomatoes. I piled the tempeh filling on that, then garnished with a dollop of Greek yogurt (I have about half a container left to use up!) and some chopped scallions. The sopas were not that great. Maybe I'll bake the ones left in the package. Frying them just made them heavy and thick. The tempeh was ok. I would like to try it again in something less complicated, so I actually taste the tempeh itself, instead of all the other strong flavors. The overall dish was great! I am taking the leftovers to school tomorrow, and I'm betting it will be ten times better after it festers for a while.